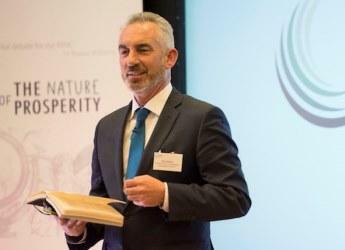 "Professor Jackson’s book, 'Prosperity without Growth' is a landmark in the sustainability debate"
Tim Jackson, Professor of Sustainable Development at the University of Surrey and Director of the Centre for the Understanding of Sustainable Prosperity (CUSP), has been announced as the speaker of the 40th T.B. Macaulay Lecture, to be presented in partnership by the James Hutton Institute and the Macaulay Development Trust on 4th October 2017. Professor Jackson’s book, “Prosperity without Growth” is a landmark in the sustainability debate. In it, he challenges conventional economics and openly questions the most highly-prized goal of politicians and economists alike: the continued pursuit of exponential economic growth. His findings provoked controversy, inspired debate and led to a new wave of research building on its arguments and conclusions. Seven years after it was first published, on the occasion of a substantially revised and updated second edition, Professor Jackson will discuss how much has changed (and remained unchanged) in the interim and argues that building a ‘post-growth’ economy is now a precise definable and meaningful task. During the last decade, he has led numerous research and policy initiatives on sustainable consumption and production in the UK and abroad. From June 2004 to March 2006, he was the sole academic representative on the UK Sustainable Consumption Round Table and co-authored their influential report I will if you will. In 2006 Professor Jackson published the Earthscan Reader on Sustainable Consumption. The annual TB Macaulay Lecture is given to stimulate thinking and dialogue about contemporary environmental issues in order to honour the vision of Dr Thomas Bassett Macaulay. Dr Macaulay was one time President and Chairman of the Sun Life Assurance Company of Canada who provided an endowment to found the Macaulay Institute for Soil Research in Aberdeen in 1930, a predecessor of the James Hutton Institute. For further information on the 40th TM Macaulay Lecture, please visit the Events pages.